If you’ve ever read this blog, you’ll know that I’m a bit of a Little Women fanatic. I love the March sisters, and as a book nerd growing up in New England, Louisa May Alcott has always been one of my heroes. When I was in grad school, what started out as archival research on a favorite author turned into a full on obsession with the Alcott family as a whole. I read everything there was to read about them. I visited their home and special collections, submerged myself in their letters, scrapbooks and diaries. (I still feel guilty about that, especially when I think of the hand-written notes that read BURN THIS IF I DIE!) This family, gone well over one hundred years, felt so very much alive to me—real-life counterparts even more fascinating than the characters I’d always known and loved. Louisa’s youngest sister, May, spoke to me especially. Not only was she the basis of Amy March (she of the traded limes and the clothespins on her nose), she was also a talented artist praised by Ruskin, a woman who taught Daniel Chester French before he created the Lincoln Memorial. On top of that, she drew angels all over the walls in her house! Her life felt like a great novel, waiting to be written. And now, Jeannine Atkins has written it. Little Woman in Blue cracks open the world of May Alcott, a gifted artist who dreams of both a career and marriage, an artistic life and a family life. Growing up in Concord surrounded by great men like Emerson, Hawthorne and Thoreau, May dreams of seeing France and achieving greatness in her own right. When her sister Louisa attains fame and success with Little Women, May is stung by the spoiled and vain depiction of youngest sister Amy. While trying to break free from her sister’s shadow and the constant ghost of her fictional foil, May follows her passions and creates her own important legacy, defying the notion that a woman must choose between dreams and family. (A surprisingly modern struggle, wouldn’t you say?) This beautifully researched novel tells the story of sisterhood, independence, and a truly remarkable woman who deserves a special place in history. I am so, so glad that her story has been told. 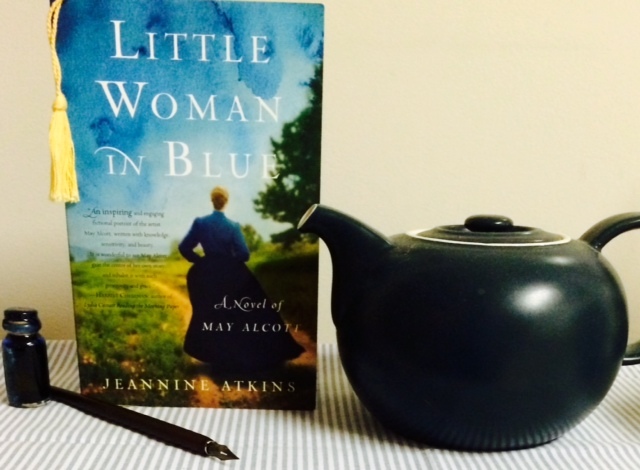 Jeannine Atkins does a brilliant job of bringing the Alcotts to life. As an aspiring scholar (AKA fangirl) of the family, I was thrilled to find them rendered just as I’ve always imagined, but with depths and angles I’d never quite considered. The relationships and portrayals of the sisters are so authentic, and Atkins does a phenomenal job of weaving together history and fiction. I loved reading about May as a character, and I found myself torn between squeezing in a few more chapters before bed each night and holding off because I didn’t want the book to end. Whether May was being courted by Julian Hawthorne in Concord or having her art displayed at the Salon in Paris, her life and the world around her completely consumed me. Even though I knew how May’s story would ultimately end, I never knew where the story would take me, and that is all a testament to the great care and craft that Jeannine Atkins has put into these pages. Even if you know nothing about the Alcotts, I highly recommend this book for a fascinating glimpse into the life of an amazing woman well ahead of her time. For fans of Little Women, there’s no question—this is a novel you can’t miss. Amy March may be a wonderful character (one of my personal favorites), but trust me when I tell you that her real-life inspiration is the one with a story worth telling. I’m so excited to announce that I’m hosting a giveaway for this novel! To enter, please comment below telling me who your favorite character in Little Women is. I’ll select one lucky winner at random on Friday, October 2, at 6:00 p.m. (ET) If you want to double your chances, you can also comment on the pinned post on my Facebook page. US only…Good luck, my little women (and men!)!!! For more on Jeannine Atkins and this wonderful book, visit www.jeannineatkins.com. You can follow her on Twitter too! For more Book Perfume Little Women fangirling, check out these posts. Okay….this sounds perfect! As I stated in another giveaway of yours (thank you!) Little Women is my all time favorite book. And while Jo has always been my favorite, I really love all the sisters and characters that novel deals with. It is one of my top “bucket list” items to go to the March home and immerse myself in the world of Louisa May Alcott. I have a feeling I would cry my eyes out just because I would finally feel like I was there, actually standing in the footsteps of the characters (and author) that have brought me so much joy. It is absolutely so awesome that you were able to go through the Alcott private collection and actually touch the papers and belongings of this fascinating family. Thank you for the awesome giveaway as well, this is definitely on my wish list! Colleen, you would LOVE Orchard House!! I totally cried the minute I walked in. It’s magical to think of the life the family led there. Louisa’s desk, May’s drawings, the spot where Anna got married…I get chills thinking about it! Thanks for reading, and good luck!!! Amy is fantastic. You would love this book!!! Least favorite? John Brooke. Was that not the question? I just wanted to stir the pot. Poor John Brooke! He was such a pal to Laurie, and he loved his Meg so! I think he just gets overshadowed by the awesomeness that is Bhaer and Laurie. Agreed. Although, I think he really begins to come into his own once he becomes a husband and a father. Remember when Meg ruins the jam and then grumps as his friend/coworker? This book sounds like exactly my thing. As much as I love all the sisters, Jo has always been my favorite. I love how complicated her view of herself is, and how she struggles to navigate the social rules and expectations that Amy’s character is so adept at understanding. Love, love, love Jo!!! Such a great point about her complicated view of herself. I just love her! Jo is my favorite if I have to pick, but my memory is a bit rusty. I think it’s time to reread Little Women! Thanks for the chance with the giveaway! You’re welcome, Kathy! It is definitely a book that deserves a reread! Every time I read it, I have a different favorite March sister! Jo of course since we shared the same name & I wanted to be feisty just like her! Thanks for the chance. Ah! How can you not love your name twin?! She is such a firecracker. Love her so! My favorite is Jo. I wanted to be more like Jo! I loved Little Women! I know, I’ve always wished I had more of her gumption! Congratulations, Jennifer!! You are the winner of this fabulous book!! Look out for an email from bookperfumesteph@gmail.com for your contact details! Congratulations, Jennifer! And thank you so much for hosting, Stephanie, and your kind words. Thanks to all for comments, so many Jo-likers! Not surprising she’s a favorite here: you walk into a group of readers and/or writers and Jo March is always there. A very nice thing. Thank YOU, Jeannine, for your fabulous book!!! And you’re right – Jo March is an inspiration for writers and readers everywhere! Thanks for the great comments, everyone!! This has been so fun!